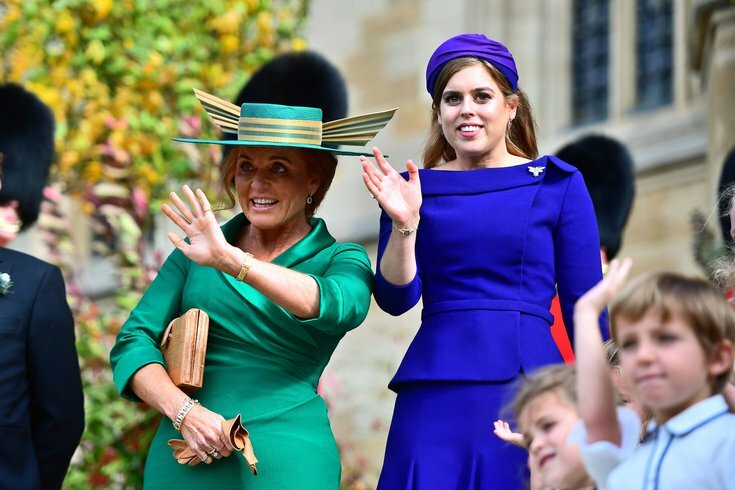 Princess Beatrice and her mother Sarah Ferguson wave to Princess Eugenie and her new husband Jack Brooksbank as they leave St George's Chapel in Windsor Castle following their wedding. If there's one thing the royals do right it's wearing hats, and there is no greater time for hat appreciation than at a royal wedding. Princess Eugenie, daughter of Prince Andrew and Sarah Ferguson, married Jack Brooksbank in London this morning. Some 850 guests attended the wedding, and there were hats galore – though with gusts up to 30 mph it was pure luck that the guests even left with their hats. This kind of hot pink doesn't work on everyone, but the Duchess of Cambridge is pulling it off quite well. Always stylish, always lovely. Her sister, Pippa, rumored to be skipping the wedding due to her pregnancy, showed up anyway looking rather regal in an emerald fascinator. The Duchess of Sussex's fashion has not disappointed since she became a member of the royal family in May. She is styled somewhat demurely in navy. Cara Delevingne looks amazing, too, in a top hat and tuxedo. While it may be an unusual choice, she definitely knows how to pull it off. Cara's sister, Poppy, wore a beautiful Oscar de la Renta dress, but confused some with that peacock-esque fascinator. Also, please join us in sending positive vibes to the unfortunate soul who had to sit behind her. And last but not least...Fergie. There are so many things to say that we can't possibly say them all, so we're just going to leave it to the internet on this one. That was, um, definitely an interesting choice.